(Bloomberg Opinion) -- Eight months ago, JPMorgan Chase & Co. Chief Executive Officer Jamie Dimon said that the likelihood of the 10-year U.S. Treasury yield reaching 5 percent was “a higher probability than most people think.” Presumably, that was based on solid economic growth and further interest-rate increases from the Federal Reserve and other central banks. That’s a big “if” to start the second sentence. As I wrote this week, it’s becoming clear that central banks have little choice but to keep monetary policy relatively easy because of the buildup in global debt over the past decade. That means, yes, there seems to be a cap to how high long-term yields can go. The 10-year yield again failed to sustain a breach of 3 percent last week, even in the face of a humming U.S. economy and a surge in Treasury borrowing. That next percentage point is going to be tough, to say nothing of another two. But that process will be slow — at least much more gradual than some traders expected earlier this year — and by the time they start tightening in earnest, the bull market’s time may be up. At this point, tightening is effectively a thing of the past, and doubts are creeping in about how much further stocks can climb. In fact, none other than JPMorgan strategists urged investors to snap up hedges against the risk of a U.S. recession in a note on Thursday. More specifically, they advocate scaling back on corporate bonds and boosting holdings of cash and government securities. They argue that the divergence between equities and Treasuries means financial markets could be in for another bout of turbulence. As for the yield curve, I understand the impetus to play down its significance because of the unprecedented monetary policy from global central banks. 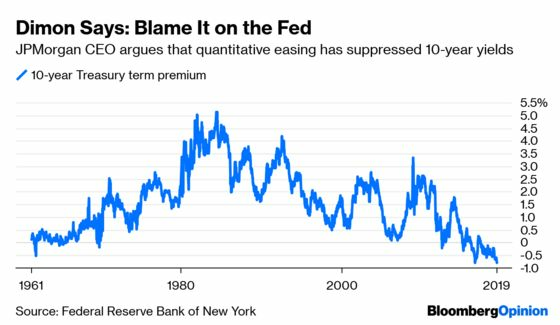 At the same time, Bloomberg News’s Vivien Lou Chen went back and found no shortage of examples of policy makers, investors and strategists who said in 2006 and 2007 that “this time is different.” Yes, the “term premium” on 10-year Treasuries is as sharply negative as anytime in history, a reflection of central-bank distortion. But that doesn’t change the fact that rates on cash-like assets are now just as high as long-term debt. No matter the reason, this will eventually shift economic decisions. That’s different from saying a downturn is inevitable. Dimon’s letter says “we are prepared for — though we are not predicting — a recession.” He reiterated that if one happens, it’ll probably be due to a “cumulative effect of negative factors” rather than mirroring past crises. One of those negative factors might just be the yield curve, should it remain inverted in the months ahead.